TP Mazembe will compete in next year's African Champions League after being crowned champions of DR Congo in 2012. Even though AS Vita Club are contesting the league title in the courts, the country's football federation has submitted Mazembe's name as champions to the Confederation of African Football. Vita Club will go into the draw for the Champions League as runners-up. The Kinshasa-based club is demanding the implementation of a recent announcement by the country's Sports Minister that the season would end early because of violence at several matches. 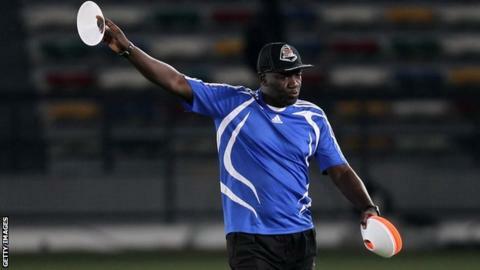 Coached by former Senegal boss Lamine Ndiaye (pictured), Mazembe clinched the title by virtue of the fact that Vita Club refused to honour a fixture against them in Lubumbashi on 20 November. "There's nothing more we can do, and we have referred clubs who feel they have been sidelined to the Football Federation's Committee to handle their grievances," Joseph Wombe, Deputy Secretary General of the League Organising Committee, said. In early November, Sports Minister Banza Mukalay decided that that the league would end prematurely because of crowd violence. "League matches have become a place for violence and dirty behaviour around the country and I can't watch and not act," he said at the time. His ruling came shortly after a game between Mazembe and St Eloi Lupopo was called off due to clashes between rival fans that left several people injured. At the time of the Minister's decision, Vita Club were top of the table, seven points clear of Mazembe, who still had four matches to complete. DR Congo's federation eventually persuaded the Minister to grant an extension that would allow the league to completed - and the federation's secretary-general Badi Ediba is standing by the decision to award Mazembe the title. "We can't see anything wrong with the report submitted by the League Organising Committee that declared Mazembe as the winners and naming the clubs that will represent our country in next year's Caf competitions," he told BBC sport. "The federation is not concerned by Vita Club's lawsuit as it was addressed to the Sports Minister." Both Mazembe and Vita Club are former African club champions, with Mazembe lifting the trophy four times, most recently in 2010, while Vita's sole victory dates back to 1973. DC Motema Pembe, who finished third in the league, and cup winners CS Don Bosco will compete in next year's Confederation Cup.